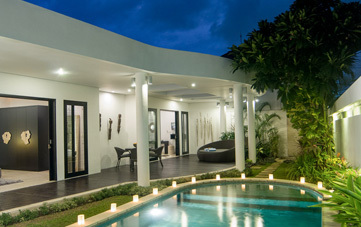 From $ 388AUD per night We have direct contracts with most villa owners. 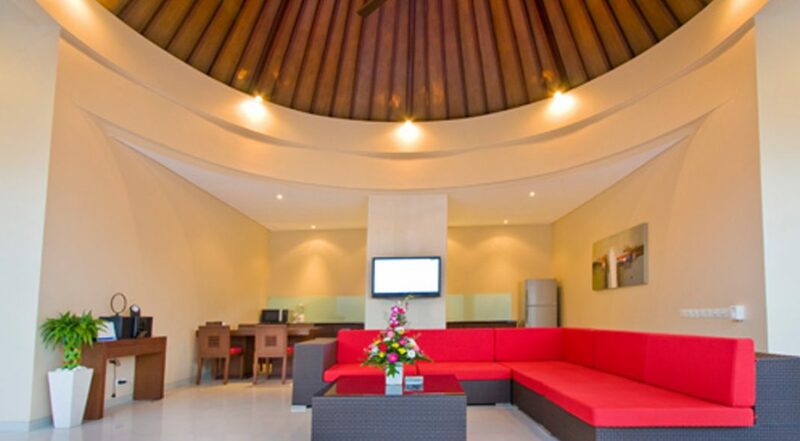 We don't add any booking fees. We are 100% transparent with no nasty surprises. 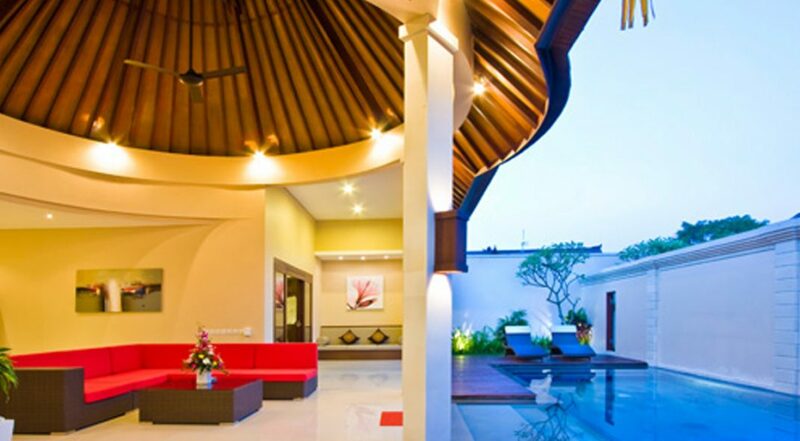 Seminyak villa in great location - rent this now! 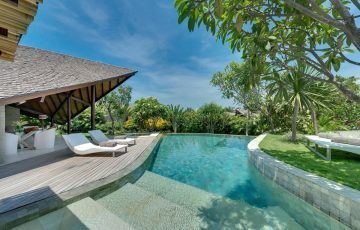 Conveniently located just off the Jalan Petitenget strip, Villa Oval is a fabulous 2 bedroom Seminyak holiday villa rental featuring modern contemporary design, a private swimming pool with fantastic open-air tropical living. 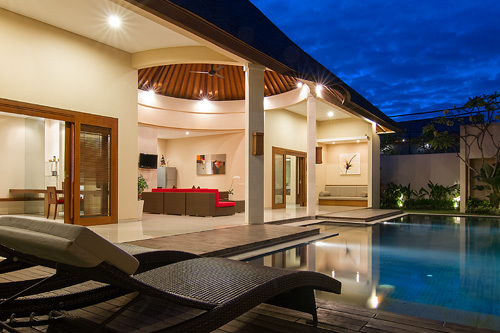 This villa is the ideal choice for a small family or group of friends wanting to be close to attractions such as Potato Head and Seminyak Beach. 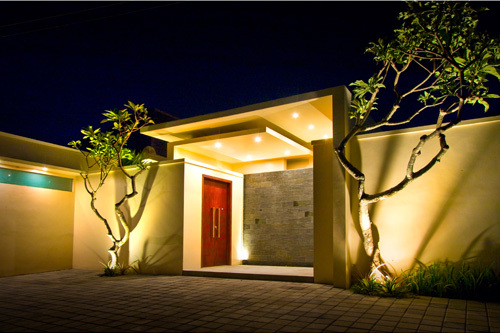 The courtyard style outdoor area is easily accessed from both bedroom suites and the living areas. 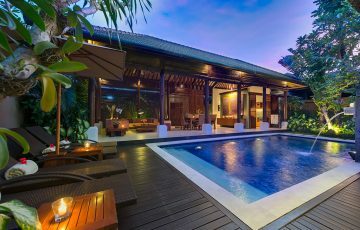 A timber pool deck runs the length of the pool and at each end the choice to relax on daybeds in shade outside your room or on the sun lounges on the deck where you can enjoy full exposure to the warm tropical sun. 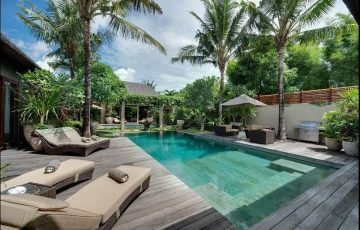 The T-shaped 12 mtr swimming pool is perfect for a morning dip to get the day going, the high perimeter wall offers guests plenty of privacy to relax and unwind. 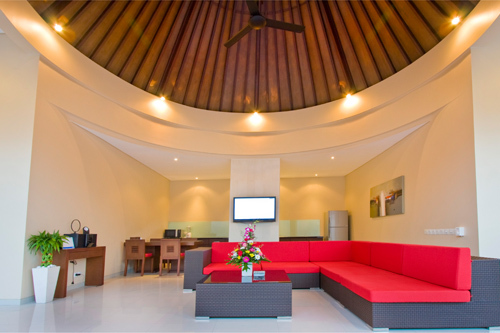 The living pavilion features a unique cone shaped ceiling with exposed timbers, where you can relax on the stylish red sofa and enjoy entertainment on the wall mounted flat-screens satellite channels or make use of the stereo system to create your own holiday vibe. 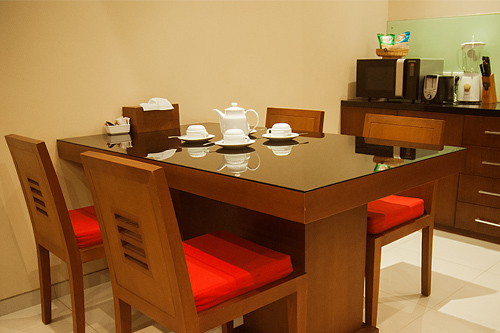 There is a cozy dining table for 4 guests and the kitchen is well equipped for you to do your own cooking if you desire. 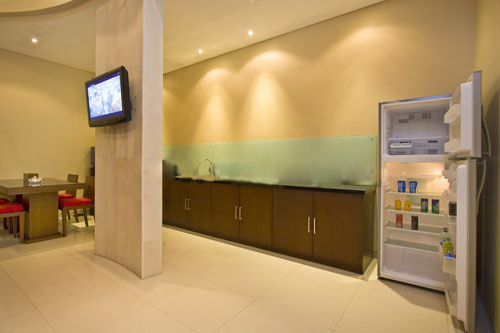 Supermarkets are also close by so you can do some grocery shopping really easily. 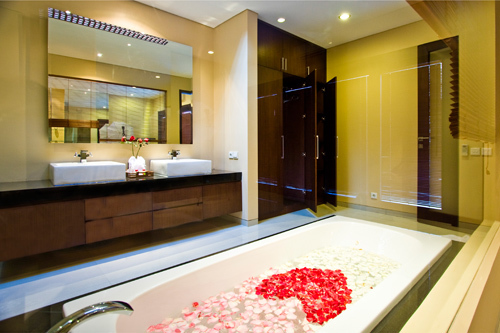 At each end of the pool are the two bedroom suites which provide direct access to the private pool. 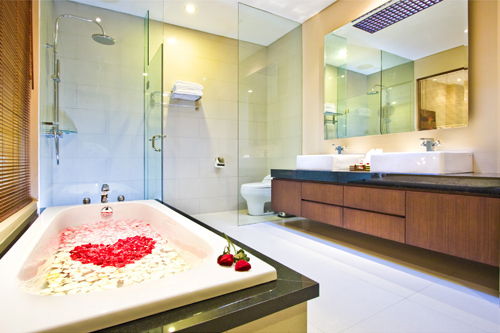 Guests can enjoy huge king sized beds, fully air-conditioned with LCD TV’s and en-suited bathrooms where you can indulge in private pampering as you soak in the sunken bath or monsoon showers. 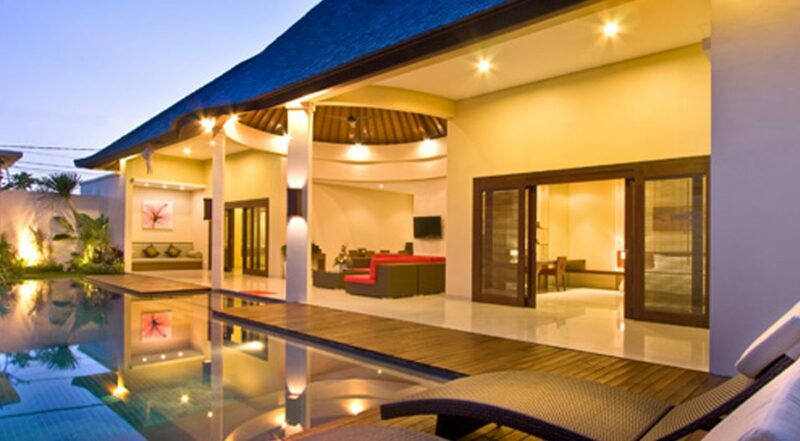 The villas manager will make sure your holiday is perfectly relaxing and help you with any special requests, bookings and transport requirements. 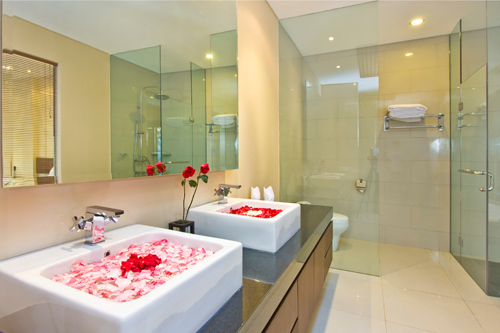 Your villa will be cleaned daily and you can request the services of a chef at an extra charge as with in-house spa and baby sitting services. If you do require a pool fence please let us know in advance (extra fees apply). 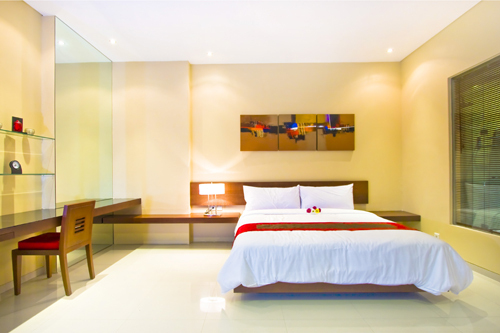 Set just off of the main Petitenget strip and famous for such iconic tourist attractions such as Potato Head and the Whoo Bar at the W Resort, Villa Oval is perfectly positioned to enjoy the more sophisticated end of Seminyak. 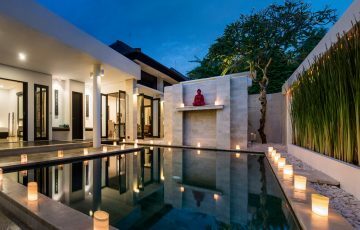 The beach is no more than 10 minutes walk from the villa and a few of the near by high-end dining venues include Sarong, Merah Putih, Biku, Saigon Street and Bambu just to name a few. If you want a fantastic breakfast with absolute beachfront location take a stroll down to La Luciola, perfect after an early morning walk on the beach. 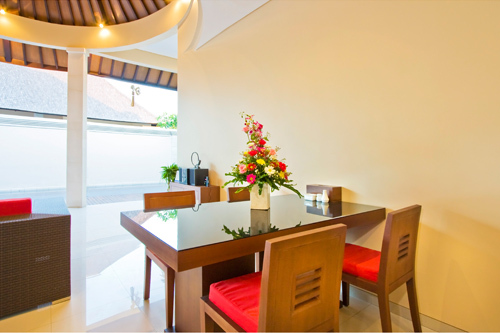 To view other similar 2 bedroom Seminyak Villas or see more family friendly Bali Villas near the popular Eat Street, please browse this website or contact our reservation team. 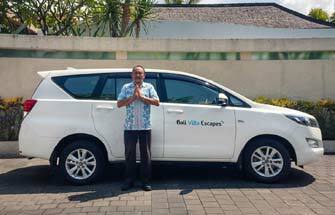 This is a popular Seminyak villa holiday to rent so if your planning a trip to Bali, especially during the Australian school or public holidays please book Villa Oval well in advance. 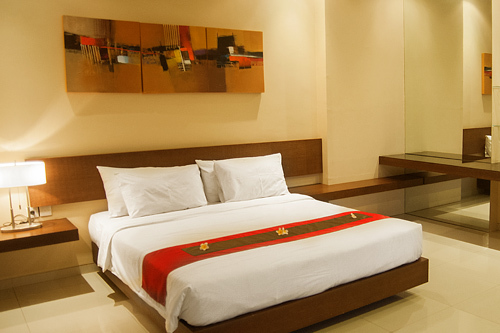 Matching bedroom suites on either side of the living pavilion are stylishly appointed with customised furnishings. 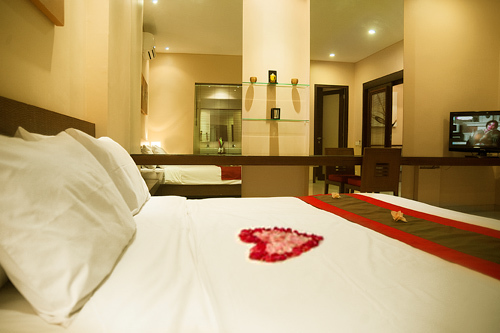 Absolutely central location with ultra friendly staff. Villa Oval had more room than we expected which meant that we had lots of privacy. For the price we found this the perfect place for the 4 of us. 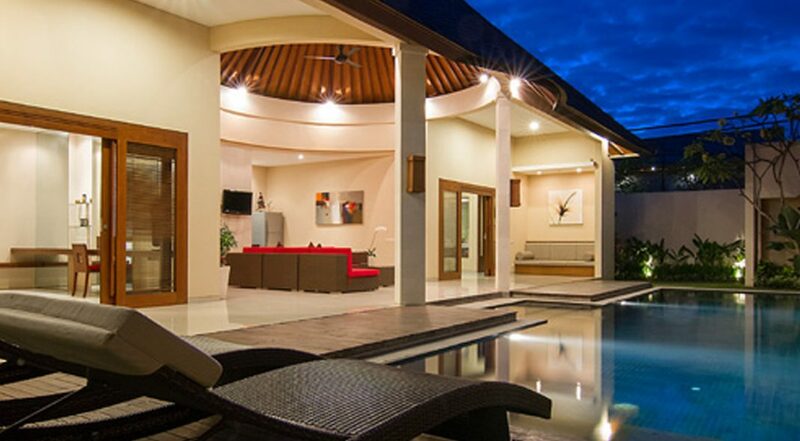 If the idea of being close to restaurants and cafes is what you want for your holiday then this is a great villa. 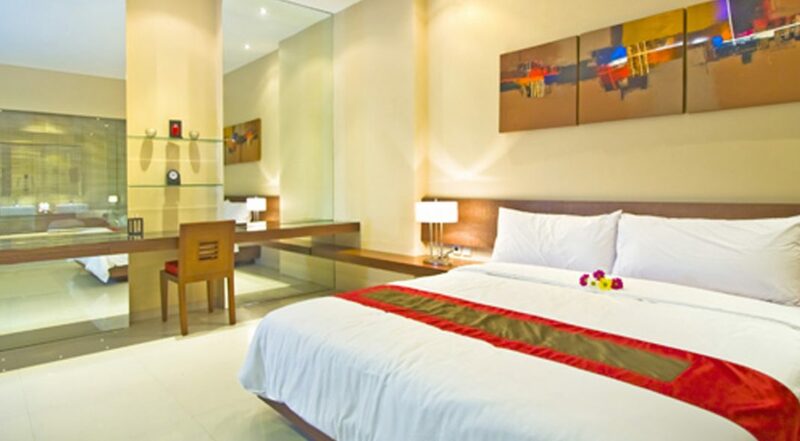 It was close to the beach as well as Seminyak Village which is where we went most nights with the kids. 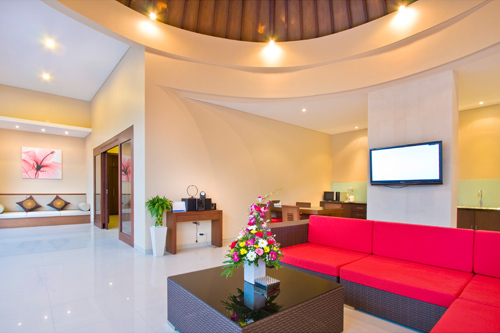 Clean, modern with a really chilled out ambiance & relaxing pool area. Definitely happy to recommend. 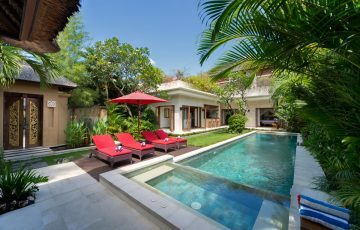 Fantastic Seminyak location so close to many of my favourite cafes and restaurants with super friendly villa staff. 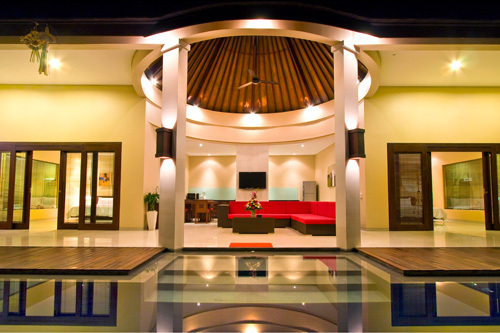 Loved the space of the villa as well - loads of room for us and our 2 young daughters. All up, really happy! TOP VALUE & HAPPY TIMES!! Thanks to all the staff at Villa Oval for the most wonderful holiday - can't wait to come back.